Did you have a nice Easter weekend? My family were coming to visit on Easter Sunday as my aunt, uncle and cousin hadn’t seen our house since we’d moved. So they came up from Arbroath, with my mum, to pay us a visit. I say us, but we had been out the night before and Disneyboi was feeling a little tender so slept off his ‘headache’ in the spare room. I made a small buffet for us, the usual nibbles, some sarnies, crisps, sausage rolls, pasta salads that sort of thing. But, as goes without saying now, I made a cake. And as I knew my relatives liked chocolate and peanut butter together, I decided to make a fudgy chocolate cake with a creamy peanut butter frosting. I adapted a couple of recipes together and came up with this triple layered cake which was very simple to make. It had cocoa powder to give the chocolatey flavour and a dash of added golden syrup for a little je ne sais quoi! I’m beginning to master my fierce furnace of a Smeg oven and it baked in no time at all. I let it cool completely then set about making the creamy, buttery peanut butter frosting. This recipe makes ample frosting to the layers and the sides. To finish the cake off, I wanted chocolatey drips. I’ve seen them on a lot of cakes recently and set about trying to replicate it myself. The answer seemed to be making something akin to ‘Ice Magic’. We used to have this stuff growing up. It’s a chocolate sauce which you pour on ice cream and it sets as soon as it touches the cold. This dripping sauce part of the recipe works well for a 'chilled in the fridge' cake. It set perfectly just as it was dripping down the sides of the peanut butter frosting. I made a random pattern on top, but if you are doing this, there is plenty in the recipe to cover the entire top of the cake too. My family loved the moist chocolate cake and deliciously gooey peanut butter frosting – oh they loved our house too! I had some cake leftover which I kept in the fridge and it seemed to get better the next day. The cake got more dense and moist and the frosting firmed up even more. All chocolate and peanut butter nutters out there – you are going to love this cake!! A moist and dense chocolate cake with a sweet and creamy PB frosting to compliment it. Preheat the oven to 180C (160C) and line and grease three 8” cake tins.In a bowl sift together the flour, bicarb, salt and cocoa powder. Stir in the granulated sugar and make a well in the centre.In a jug, beat together the eggs, veg oil, 225 ml of the milk and golden syrup.Pour this into the dry ingredients and mix well with a spoon or spatula until smooth and all the ingredients have combined.Divide the cake batter equally between the three cake tins and place into the oven for 20 to 25 minutes.The cakes will be baked when a toothpick comes out clean from the centre.Allow to cool for 10 minutes in the tins, before turning out on to cooling racks and letting them cool completely.To make the frosting, beat the peanut butter and softened butter together until smooth in a food mixer or with a hand held mixer.Add 50 grams of the icing sugar, the remaining milk and vanilla and beat to combine. Add the rest of the icing sugar gradually until the frosting is smooth and slightly thicker.Spread the frosting on each layer of the cake and place on top of one another.Coat the top and sides with a thin layer of the frosting and refrigerate for at least half an hour, to let the frosting firm up.Remove from the fridge and coat the top and side of the cake more liberally. To achieve a clean finish, heat your palette knife up (either over a gas burner or with some hot water) before smoothing over the frosting.Place into the fridge for at least an hour to cool completely.To make the chocolate topping, melt the chocolate chips and coconut oil together in a bowl over a simmering pan of water.Let it cool slightly before spooning over the cake or placing it in a piping bag and piping it over the top of the cake. Go close to the edges so the chocolate drips. It should chill and go solid before getting to the bottom of the cake.Chill until ready to serve.Enjoy! I hope, like the cake, that Disneyboi was 'better' the next day! Loved Ice Magic when I was wee... I bout a Reese's one recently which was lovely - I agree peanut butter and chocolate is a winner! Never heard of Ice Magic before? But the cake looks great! I am a huge fan of peanut butter and chocolate, more peanut butter then chocolate, but they go well together! I'm not surprised it went down well with everyone! Oh and I too think cake can sometimes be better the next day - unlike cookies that taste great right out of the oven! Holy moly..... now that is one impressive cake. Chocolate & peanut butter together gets me all SWOONY. :) My housemate bought some ice magic a few months back, the concept seemed to blow his mind, anyways, he stored it in the fridge and didn't understand why it wouldn't come out of the bottle. Hahaha! Great cake, pinning for my next bake up. This looks so impressive. I bet it tasted pretty amazing too. I adore peanut butter, I would have been all over this! I seem to have lived a sheltered life - I've never known the joy of ice magic. Love this cake, though. Very suitable Easter indulgence. What a maste piece of a cake and the flavour combinations are amazing. Brilliant idea with that chocolate sauce. This look amazing, I love the sound of the chocolate and peanut butter frosting especially! And how it drizzles down the side of the chilled cake makes it look even more inviting. I can imagine your family will be visiting a lot if they're served cakes like that! Genius idea! I'm all over pb cake. And those drizzles look so good :) Glad your Easter gathering went well. I really just want to face plant myself in to your cake. Is that wierd???? That looks spectacular and the flavours sound so good. 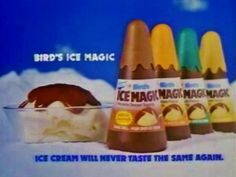 I remember ice magic toppings but bet yours tastes way better! Oh how could this cake be anything but sensational with those ingredients!! Looks awesome! What a monster - a chocolate one of epic proportions that totally has me swooning. And the peanut butter addition is just fabulous. Lovely lovely lovely! What a beautiful cake. I love the fudgy layers, the fact that it is chocolate & peanut butter, the amazing-looking texture of the frosting on the sides and the perfectly drippy chocolate..... oh.... and the pattern on the top looks fab as well! OMG. Do you see into my foodie dreams or what! ?